Don't jump to any conclusions yet, wannabe Guardians, but according to a new job listing Destiny studio Bungie is looking for a "PC compatibility tester". The advertisement, published on the careers page at Bungie.net, seeks people who can "evaluate PC hardware-specific features and ensure various systems work together across multiple PC configurations to provide a great experience". Does that mean Destiny is coming to PC? Honestly, I don't know. The game's first major expansion, The Taken King, is due in September. It feels unlikely a PC version of that is going to materialise anytime soon, unless Bungie plans to launch it far later than the console versions. What seems more likely is that this role is related to the inevitable Destiny 2, which is expected towards the end of 2016, but at this point all we can do is cross our fingers. Certainly publisher Activision isn't closed to the idea of Destiny on PC (because, hey, dollars). 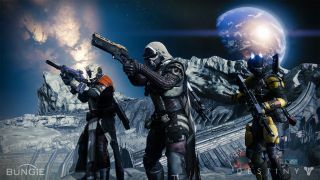 Last year Activision Publishing's CEO Erik Hershberg indicated it was a possibility: "Again, no announcements, but it's something that's a heavy point of discussion," he said in June last year – months before the game's September release. "You know, developing on PC is a different animal than developing for consoles and so we just want to make sure that we're putting one foot in front of the other and getting it right, and that it's of the highest possible quality. But obviously I see the same things about the natural fit." At least PC has one Destiny feature the consoles can no longer boast: the loot cave.